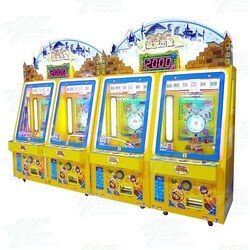 Adventure Castle Redemption Game Machine 4 Players is a luck ticket redemption machine and is easy to play, to give the players well easily winning feeling. In a simple game by inputting coin & pressing "start" buttons to launch tokens, then players according to tokens location to get corresponding lottery tickets or challenge JACKPOT bonus to win more lottery tickets. Adventure Castle Redemption Game Machine 4 Players is a luck ticket redemption machine and is easy to play, to give the players well easily winning feeling. In a simple game by inputting coin & pressing "start" buttons to launch tokens, then players according to tokens location to get corresponding lottery tickets or challenge JACKPOT bonus to win more lottery tickets.